By Andrew Liszewski on 02/21/11 • Leave a comment! 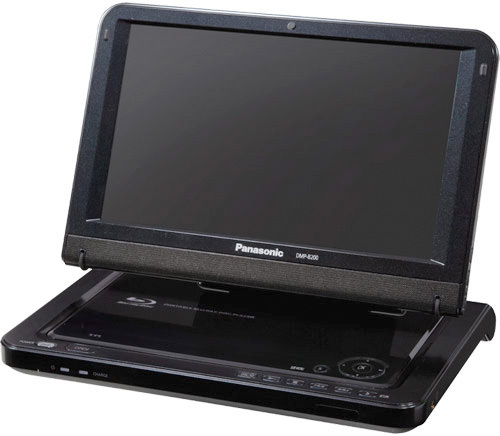 When we brought you Panasonic’s first portable Blu-ray player way back at CES 2009, we lamented at the fact its 1024×600 LCD display couldn’t even muster up a 720P resolution. But the company has just released the latest version of this player, and besides looking considerably more svelte than the original, it now boasts a display resolution of- …wait, 1024×600 still? Lame! I can understand the reasoning behind not wanting to cram a 1080P display’s worth of pixels into an 8.9-inch screen, but you still can’t give us at least 720P Panasonic? You could even then start boasting about its high-def display! Anyways, like the original it seems to be more of a portable solution for playing Blu-ray movies on a big-screen HDTV since it includes an HDMI connection. 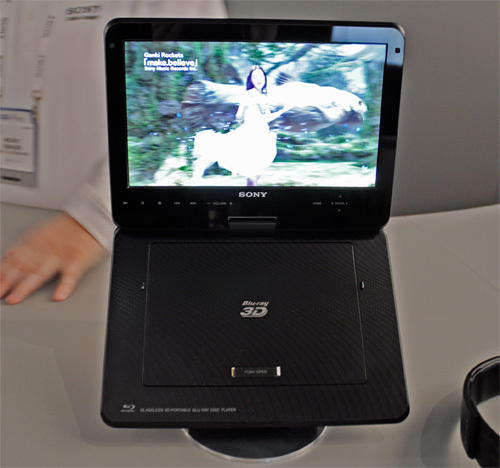 When using it as a standalone player though the built-in rechargeable battery is good for about 4 hours of playback with the screen completely dimmed, and besides DVD and BR capabilities, the player also has an SD card slot for loading video content, or just letting it serve as an expensive digital photo frame. $299.99, available now. By Andrew Liszewski on 01/08/11 • Leave a comment! 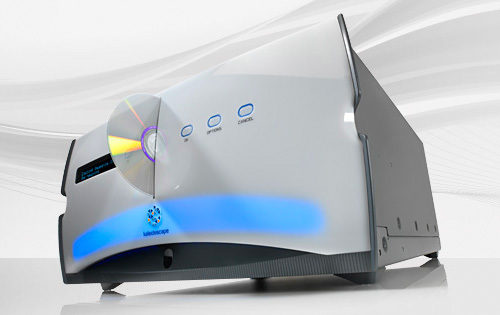 They have no plans to put it into production at the moment, but at the ‘Future 3D Technology Demo’ section of their CES booth, Sony had this fully-working glasses-free 3D Blu-ray player on display. While 3D was still the prevalent theme of the show this year, there was actually quite a bit of glasses-free 3D technology on display. But I’m sorry to report that the 3D demos playing on this weren’t exactly mind-blowing, though I suspect it was the content to blame since it didn’t look like genuine 3D footage. Sony had other glasses-free 3D technology on display at their booth that looked quite impressive. If you’re a fan of unusual clocks and leaving your hi-def TV running for hours on end, you might want to look into the Blu-ray version of Maarten Baas’ Real Time exhibition which was shown in Milan earlier this year. According to BLTD, the Blu-ray disc will include 12 hours of what appears to be your standard red segmented LCD display, but turns out to be a cleverly backlit artpiece with someone in the background physically painting and erasing the segments to change the time. As clocks go it looks like it’s horribly inaccurate, but as an art piece I find it oddly fascinating to watch… Will you look at the time! By Andrew Liszewski on 08/12/10 • Leave a comment! Yesterday Samsung announced their BD-C8000 which is technically the world’s first portable Blu-ray player. 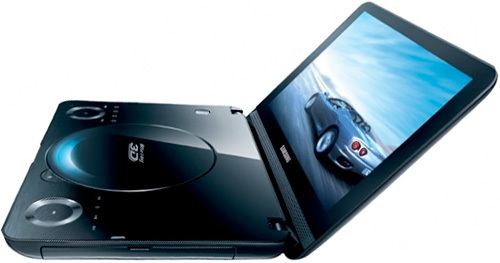 It comes with a hefty 10.3-inch LCD display that’s actually 1080P capable, as well as built-in wi-fi which provides access to the small library of Samsung Apps, HDMI out and a 3-hour battery. However, don’t get too excited about enjoying 3D content on your next flight, since it only provides a 3D experience when connected to a 3DTV. By itself it’s just a regular old portable Blu-ray player. So given the fact that 3DTVs aren’t exactly everywhere yet, let alone a hotel room where you’d probably be most likely to use this, the $499.95 price tag, available now, is a bit steep. 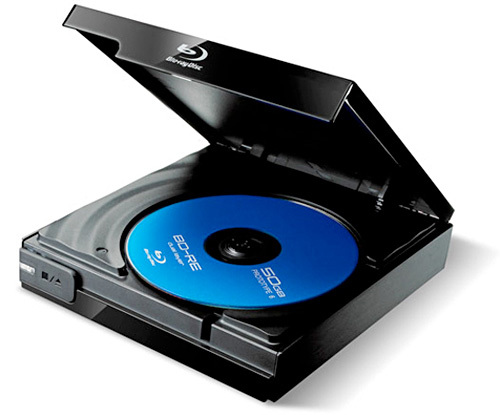 If you haven’t hopped on the Blu-ray bandwagon, it’s becoming easier and easier. Heck, the last two Blu-ray movies I bought also came with a DVD copy as well. Blu-ray players themselves have long since broken the sub-$200 barrier, and now you can even get yourself one that plays your old-school VHS taps on the cheap. Up for grabs over on Amazon Is a Panasonic DMP-BD70V which plays Blu-ray and VHS for $140. If you’ve got the cash and are thinking about upgrading to the new format, then this sounds like a solid buy. Barring the formats that died before they ever took off (Betamax, Laserdisc, HD-DVD) it’ll play pretty much any video you’ve purchased since the 70’s. There’s even an SD card slot, USB port and internet functionality to stream video from YouTube and Amazon VOD. The price was supposedly only good through yesterday, but it seems to be sticking around. I’d jump on this soon though. If your home theater is powered by a Windows Media Center PC, the ideal solution if you have a large Blu-ray collection is to rip all of your movies to a hard drive. 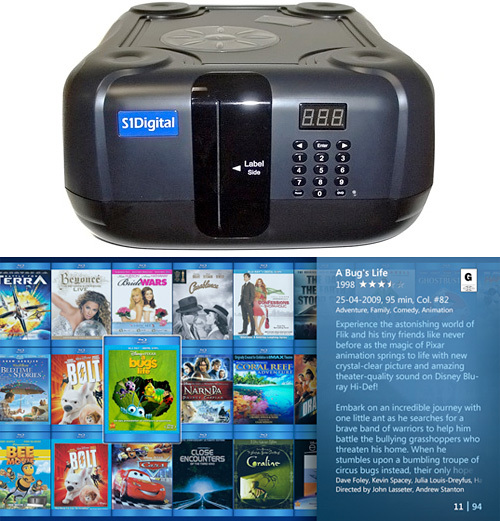 But that also requires a decent amount of storage, so as an alternative you can go with S1Digital’s Blu-ray Disc Changer which can accommodate up to 100 discs, making them available to watch almost instantly without having to constantly load each one. The included MyMovies software also automatically scans each disc and downloads metadata and cover art so you have a more visually-pleasing way to browse your collection. However, when connected to an S1Digital Entertainment Center, or any Windows Home Server with enough storage, the Blu-ray Disc Changer can also be used to automatically rip your collection so that it’s available to any PC or media streaming device on your network. With a price tag of $1,500 you’re definitely paying for convenience here, though for that much money it would have been nice if the changer at least had an HDMI connection so you could hook it directly to an HDTV. From what I can tell it’s only equipped with USB 2. As far as we could determine, Lexicon didn’t change a single thing in terms of the hardware. Heck, they didn’t even lift the boards out of the chassis, opting instead to cut out the bottom of their own chassis to accommodate the venting locations, and putting a darker blue filter over the Oppo’s VFD display to give it a slightly deeper hue. But wait, the Lexicon BD-30 is THX certified and the Oppo BDP-83 isn’t, so they must have done something to it, right? Or, it could be that the BD-30 actually fails the basic THX audio certification, and since Audioholics pointed that out to THX and Lexicon, all of the branding and mentions of the BD-30 being THX certified disappeared from the THX and Lexicon websites. I can’t say that this kind of thing surprises me, but it does make me wonder just how many mid to high end electronics out there are just slightly modified and dressed up versions of basic units… All the more reason to do your research before you plunk down a whole bunch of money for something that may just be a budget model in disguise.